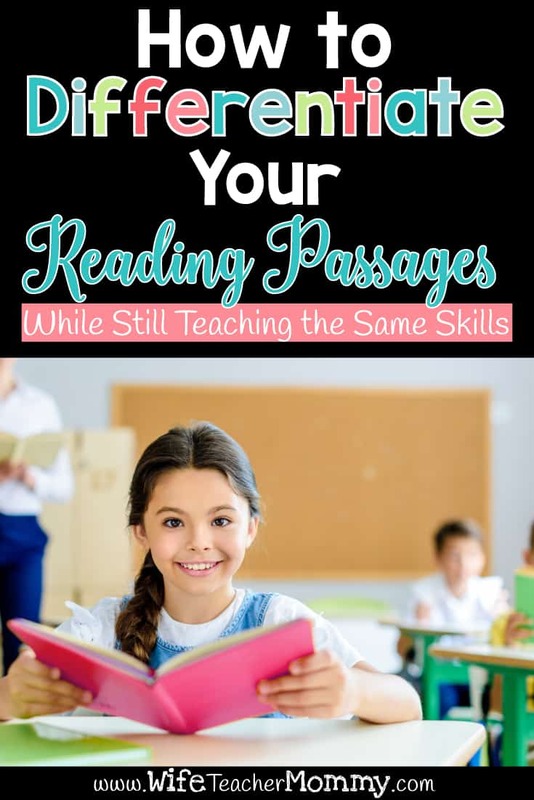 Inside: How to differentiate your reading comprehension passages- while still teaching the same skills! These ideas for differentiated reading lesson plans are sure to help you differentiate your reading activities and passages. No matter what grade level you are teaching, you’re bound to have varied levels of readers in your class. A 3rd grade class, for example, may have students reading at a 2nd grade level (or below), and at a 4th grade level (or above!) With such a variety of students, it’s difficult to figure out how to differentiate your reading passages (while still teaching the same skills), but it’s possible with these tips. Focus on reading comprehension skills. Even if you are using leveled passages, make sure to have the same skills covered. For example, if you’re assessing understanding of main idea, make sure you have a question that asks about main idea and supporting details. To differentiate within the questions, the vocabulary may differ or you may have higher level readers write their own main idea rather than identify one from predetermined choices. Regardless of the skill level of your students, make sure to assess necessary skills at each level. Make sure content is age-appropriate as you differentiate. The challenge of finding below grade level content can be finding subject matter that interests students based on their age rather than their reading level. For example, sixth graders reading at a second grade level do not have the same social and emotional interests as typical second graders. Books about farm animals or the pictures and formatting contained in those texts may not appeal to sixth graders. The same can be said for students reading far above grade level. Although they may read at a post-high school level, sixth graders may not be ready for the language or maturity of subject matter in adult books. With our differentiated reading passages, we made sure to choose topics that are relevant to students at all ages. That way, no matter what level your student is reading, they will be able to enjoy the content. Using a bundle of leveled passages with the same questions and title allows students to have content that reflects their age. Plus, all the work is done for you, so you won’t have to hunt for hard to find passages! Don’t single students out when you differentiate your reading activities. By using passages with the same title and questions (just different passages for leveled readers), students will not notice the differences between the high, medium, and low passages. With small symbols to differentiate the passages, you won’t even need to copy on different colors. Gone are the days of pink, green, and blue papers calling attention to students’ reading levels. Simply use the handouts as is, and your students will be able to answer questions and discuss the text content with their peers after reading independently or within small groups. If you’re still reading, chances are you would LOVE our differentiated reading comprehension passages! These differentiated reading comprehension passages include a low, medium, and high passage for each grade. Each passage has the SAME title and questions- and covers the same skills. The difference is only in the passages themselves- to meet each student at their own reading level. Learning how to differentiate your reading passages (while still teaching the same skills) can be simple with bundles of specially designed reading passages for students with low, medium, and high reading levels. Focusing on the skills and content with the same titles and questions will help all learners reach their goals to improve reading comprehension! *SNEAK PEEK!! * I will be releasing some FREE reading comprehension passages soon that will make this process so much easier. Sign up for my email list HERE and you’ll be the FIRST to know when they are ready. 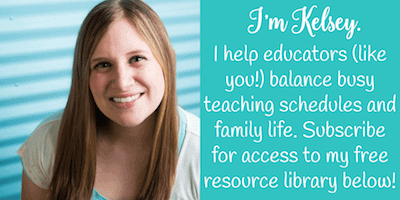 You will also get instant access to my free resource library that already includes 24 freebies and counting!